Yesterday I kicked off a month-long series in which I’ll be looking at each of 29 NBA franchises (excluding the Charlotte Bobcats) and determining each team’s All-time starting lineup. First up were (coincidentally, but deservingly) the Boston Celtics, as storied and legendary an organization as there’s been in the NBA, and a franchise whose fingerprints can be found through the pages of NBA history. 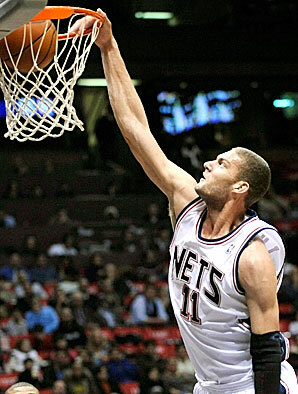 Today, the New Jersey Nets. Yikes. Sorry Jersey, but if yesterday was a Smith & Wollensky porterhouse, today’s leftover cold-cuts. Sadly, with the notable and fleeting exception of the Jason Kidd era just after the turn of the last century, the Nets’ history is chock-full of mediocrity and irrelevance, with the franchise’s most noteworthy “accomplishment” being the atrocious 12-win 2009-10 season. And while the emergence of Brook Lopez as an elite big man, combined with the ambition and seemingly endless wealth of new owner, Russian billionaire Mikhail Prokhorov, provide optimism for the future, the franchise’s present remains grim after a fruitless free agency period, and its history is anything but “storied”. The lone member of this group whose achievements include team success. 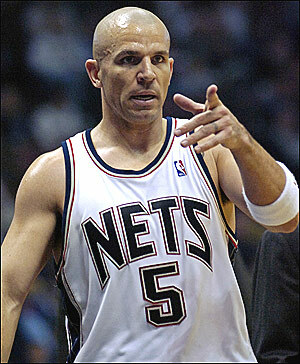 In 6+ years in New Jersey, Kidd was one of the game’s great all-around guards, the catalyst for back-to-back Finals trips and the primary driver behind Kenyon Martin and Richard Jefferson receiving eight-figure salaries. Even in his prime, Kidd struggled to score efficiently (sub-40% FG), but he remains the franchise leader in rebounds and assists per game among guards. 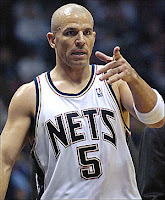 Jason Kidd’s most impressive statistic from his time with the Nets? In franchise history (dating back to 1976), only six times have the Nets finished the regular season less than 11 games out of first place, with all six occurring consecutively –Kidd’s first six seasons with the team. Interestingly, the PG position for the New Jersey Nets over the past three decades has featured a disproportionate number of talented and productive lead guards – in addition to Kidd, Micheal Ray Richardson (16.1 ppg, 6.8 apg, 2.7 spg), Mookie Blaylock (13- 5.9- 2.2), Kenny Anderson (15.3- 7.8), Stephon Marbury (23- 8.1) and Sam Cassell (19.5- 7.6 in just 201 games) have all run the point in Jersey – but none combined statistics with team success the way that Jason Kidd did. The first European to achieve legitimate NBA stardom, and an enduring source of inspiration for a franchise in desperate need of it. Prior to his tragic death in an auto accident at age 28, Petrovic had become one of the league’s top perimeter scorers, averaging 22.3 ppg, shooting 51.8% from the field and hitting 45% of his 3-point attempts in his final season (1992-93). 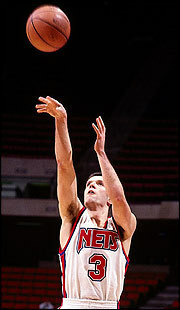 Given the increased importance of the 3-point shot since his passing, there’s little doubt that an incredible shooter like Petrovic would have been one of the great scorers of the 1990s and likely contributed to contending teams – perhaps altering the career arcs of Kenny Anderson and Derrick Coleman in the process – had he been able to enjoy a lengthy career. Outside of Petrovic, Vince Carter is the only noteworthy SG in Nets’ history (Kerry Kittles? Otis Birdsong?). And while, after flirting with greatness in Toronto, Carter put up outstanding numbers (23.6 ppg, 5.8 rpg, 4.7 apg, in 374 games) in his 4+ years with the Nets – easily surpassing those of Petrovic – his time in New Jersey will be remembered for the team’s post-Finals return to mediocrity and Carter’s inability to combine with Jason Kidd to consistently keep the team competitive. He may have been somewhat unmotivated and a bit of an underachiever, but during his five seasons with the Nets, DC was still a hell of a good player. History hasn’t been kind in its assessment of Coleman’s time in New Jersey – to the point that he wasn’t a productive player – but despite making just one All-Star team, DC was a consistent 20-10 guy that did have a positive impact on team success in the short run, teaming with Kenny Anderson to produce two of the Nets’ three winning seasons between 1984-85 and 2001-02. 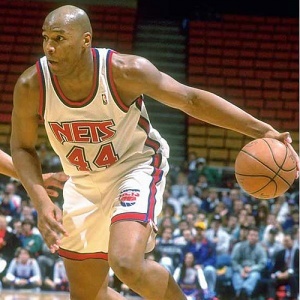 Statistically, Coleman had some solid competition, but from an all-around perspective, he easily surpassed Keith Van Horn (18.2- 7.6) and Richard Jefferson (17.4- 5.4), and while he couldn’t edge out Bernard King’s great two-year, late-1970s run with the Nets (20.2- 7.8 in 193 games), his relative longevity with the franchise earned him the nod. Richard Jefferson was also deserving of strong consideration, putting up solid stats in back-to-back Finals runs – making him the solid #2 choice here – but he was never the face of the franchise and it’s pretty clear that a good chunk of Jefferson’s success is directly attributable to Jason Kidd. Not a whole lot of competition for this spot (Armen Gilliam and a young Jayson Williams made non-compelling cases), but Buck Williams is a more-than-deserving recipient. In his prime, Williams was a stronger and more productive version of Horace Grant – athletic and a warrior on the glass, with a nice game out to ~15 feet. Sadly, the 1982 Rookie of the Year and one of the best PF’s of the 1980s spent his best years on a string of forgettable Nets teams. 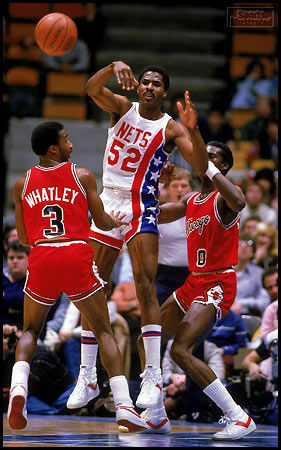 Although he left the Nets after the 1988-89 season, Buck Williams remains the franchise leader in games played (635), points (10,440), rebounds (7,576), rebounds per game (11.9). Again, not much to work with here, so we’re gonna project a bit. Lopez is an excellent young player and look poised to be a top-3 center for the next decade, but it’s a sad commentary on a franchise when after 35 years of history, the best-ever player at one of the most important positions on the floor has just two years under belt and is coming off a 12-win season, but such is the state of affairs with the Nets. However, from Year 1 to Year 2, Lopez improved both his scoring (from 13 to 18.8 ppg) and rebounding (8.1 to 8.6 rpg), and seems like a solid bet to reach the 20-10 in 2010-11, and probably in seasons to come, and is sure to play a huge role in any success this team enjoys in the years to come. The only other names of note – and I use that term loosely – in the middle for the Nets were Sam Bowie (12.8 ppg, 8.2 rpg, 1.6 bpg in 280 games from 1989-93) and Shawn Bradley (12.3- 8- 3.8 bpg), both of whom grabbed 8+ boards, protected the rim (check out Bradley’s blocks per game!) and each contributed more than a dozen points per game. It’s worth noting that, when healthy, “the guy picked ahead of Jordan” was actually a decent player. It helps also that in addition to Bowie, Lopez’s competition for this spot was Mike Gminski, Chris Dudley and an aging Darryl Dawkins.